Hundreds of thousands of Cubans have protested against the US government. Demonstrators brought the capital, Havana, to a standstill as they filed past the US mission. Cuban President Fidel Castro called for the march after the US building put up an electronic sign to stream news and human rights messages. He described the illuminated display as a gross provocation in his speech to the marchers. The US began flashing messages via the 1.5 metre-high sign on 16 January. Diplomats said it was an attempt to provide uncensored news to people and break Cuba's "information blockade". 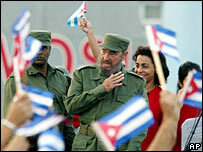 Mr Castro, who observed the march from a platform for five hours, accused the US of trying to destroy ties. As he spoke, the sign continued to flash up news of the Canadian elections and quotes by leaders such as Abraham Lincoln and Mahatma Gandhi. Mr Castro also denounced the case of Luis Posada Carriles, the Cuban exile militant who has been held by the US since May 2005 on immigration charges. A former CIA operative, he has been accused by Cuba and Venezuela of assassination plots against Mr Castro and the bombing of a Cuban airliner in 1976 in which 73 people died. The march was held to coincide with the end of a 90-day detention period for Mr Posada Carriles. Mr Castro accused the US of deliberately seeking to free Mr Posada Carriles, who he called a terrorist and a repugnant character. 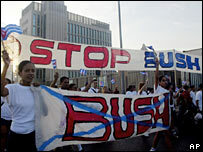 Workers and students chanted "Bush fascist, condemn the terrorist" as they marched waving Cuban flags and signs depicting Mr Posada Carriles as a murderer. Signs erected near the US mission equated US President George W Bush with Adolph Hitler. A huge poster outside the mission depicted Mr Bush and Mr Posada Carriles as vampires.